Do Goji Berries Help Lower Blood Sugar? 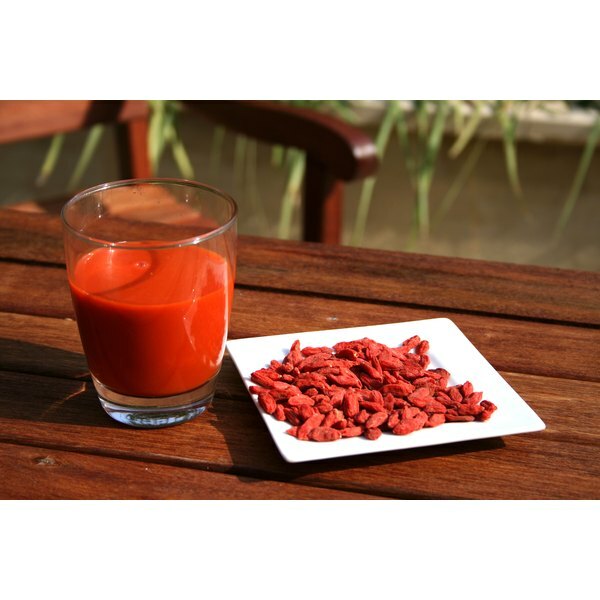 Goji juice is derived from berries of the plants Lycium barbarum and Lycium chinense. Marketers promote this juice not only as a health tonic but for treating cancer and other serious diseases. The Memorial Sloan-Kettering Cancer Center, or MSKCC, cites laboratory and animal research indicating potential benefits of goji for treating and preventing illness, but cautions that research with humans is lacking. Consult a qualified medical practitioner before using goji juice for health purposes. Goji berries have several uses based on tradition, as noted by the MSKCC. People have used the berries for relieving inflammation, aches, skin irritation and nose bleeds, and also as a sedative. Chinese medicine includes goji with other herbal components for treating coughing, anemia and vision problems. Laboratory research has "clearly established" that polysaccharides isolated from Lycium barbarum fruit have potent antioxidant activity, according to research published in the May 22, 2007 issue of the "Journal of Ethnopharmacology." Oxidative damage caused by free radicals increases with age and is theorized to be a main factor in many health disorders, as noted by the study authors. In this present study, researchers assessed the effect of goji polysaccharides on oxidative stress in aged mice receiving the substance orally for 30 days. The goji components appeared to return antioxidant activity to normal and to benefit immune function in these mice. The study authors determined the effects as comparable to antioxidant activity of vitamin C. Adding vitamin C to the goji polysaccharides increased goji antioxidant activity. Goji berry contains beta-sitosterol, a substance that can prevent cholesterol absorption in the digestive tract, according to the MSKCC. Research with rabbits published in the Nov. 26, 2004 issue of "Life Sciences" found that Lycium barbarum fruit extracts and fractions significantly lowered levels of blood serum total cholesterol and triglycerides, while also increasing levels of high-density lipoprotein cholesterol, the so-called good cholesterol. Blood sugar decreased as well. Polysaccharides isolated from Lycium barbarum appear to have anti-tumorigenic properties, meaning they inhibit tumor formation and growth, according to the MSKCC. These polysaccharides also have immune-enhancing activity. The MSKCC cites a Chinese study from 1994 in which goji polysaccharides had positive effects when combined with certain cancer therapy, but research is lacking on the effect of goji with current cancer treatment methods. Laboratory research appearing in the "Journal of Alzheimer's Disease" in 2010, Vol. 19, No. 3, found that polysaccharides isolated from Lycium barbarum have neuroprotective effects and may have the potential to prevent Alzheimer's disease. These polysaccharides lessen the negative effects of elevated homocysteine levels in plasma, which is associated with an increased risk of the disease.